I’ve noticed a pattern when it comes to being successful at just about anything. And what I’ve noticed is that success can be broken down into three steps. I’ve found that all success I’ve come across follows this pattern broadly speaking. If you want to become successful at something you are going to have to first become aware. Aware of what. What it is you want, really want. Where you currently are. What you need to change. Aware of who you need to contact. Aware of how to go about making the change. Aware of what strategy to employ. Awareness. It all starts with a greater level of awareness. If you’re not currently successful in that area of you life, then you will undoubtably have to do something different. This will require a certain behaviour change. Perhaps the goal is to be successful in your health. Firstly you need to become aware about what exactly health is to you, aware of your numbers, measurements of other reference points to determine you are making progress. Then you need to change your current behaviour. Maybe eating differently, exercising or moving differently, perhaps drinking less, going to the gym or a class. Some kind of behaviour change needs to happen. Like they say, if you want something different to what you already have, you’re going to have to do something different to what you’ve already done. Consistency trumps it! If you want to be successful at some endeavour, you will have to be consistent in your approach to it. Going back to getting healthier, it’s no good going to the gym once, or eating a healthy meal once in a while. It’s what you do consistently that matters in the long run. Any successful person you see (even the so-called overnight successes) usually have consistent action of many months, years and even decades behind them fuelling that success. 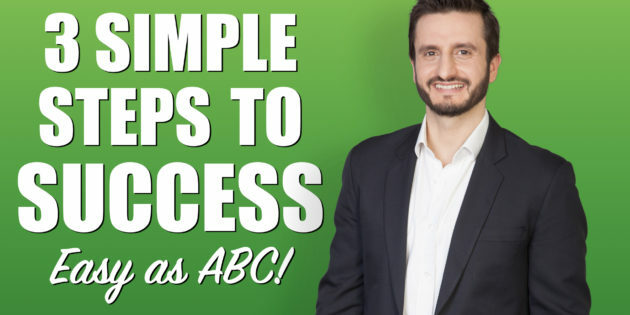 So think about what you want to achieve and think about it in the ABC terms and you will notice that you get there a lot sooner. And I also think (in my experience) that the last part – although simple, is the hardest. Doing something different consistently time and time again to get what you want. That’s the toughest part. Once you get the awareness, it’s often quite easy to make a behavioural change. We get excited and motivated for a short period of time. Just think new years resolutions. But it’s “C” – consistency that really matters after the hype of the occasion has dwindled. What do you think about this way of viewing success? Do you agree with me? Enter your name and email address to receive the first 3 chapters of Hari's book - The Thought Gym - absolutely free! Your details are safe. We will never share them with anyone. What Kind of Workout Is The Best?